“Massage Therapy” is the assessment of the soft tissues and joints of the body and the treatment and prevention of physical dysfunction and pain of the soft tissues and joints by manipulation to develop, maintain, and rehabilitate or augment physical function, or to relieve pain. The New Brunswick Massotherapy Association (NBMA) has been incorporated as a non-profit organization since 1988. Since our incorporation, membership has grown from less than a dozen therapists to almost 200 at present. The NBMA provides information and public education about Massotherapy and free referral service to the public in locating Registered Massotherapists to communities across N.B. The Association also provides a forum for on-going professional development and exchange, as well as maintains high professional standards for its members. 1. To maintain high professional standards for its members. 2. To provide a forum for on-going professional development and exchange. 3. To provide information and public education about Massage Therapy. If you have any questions or concerns do not hesitate to contact us. 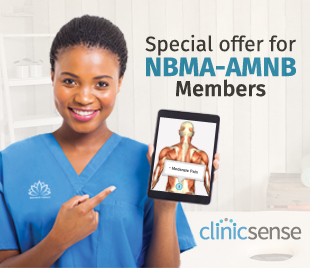 Your first contact will be with our Registrar who will direct your query to the executive committee of the NBMA. We can be contacted by phone, e-mail or letter.